As noted by Cult of Mac, Apple has removed references to the Messages for Mac beta that the company released for OS X Lion in mid-February to provide a preview of the functionality coming in OS X Mountain Lion. There’s still a Messages for Mac link at the bottom of Apple’s Downloads page — as you can see below — but again, it just redirects to the Mac OS X page, where a Messages beta cannot be found. It’s likely that Apple is now happy with how beta testing has gone, and that it has already prepared a final release that will launch alongside Mountain Lion in July. Apple has not removed the download entirely, however, as it is still accessible via direct download (63.8 MB). It is unknown how long Apple will continue hosting the download, but text strings found within the app earlier this year suggest that the app itself will expire once OS X Mountain Lion is released and Messages will be a Mountain Lion exclusive. Apple announced yesterday that OS X Mountain Lion will launch in July and be priced at $19.99 through the Mac App Store. Users of Snow Leopard and Lion will be able to upgrade to Mountain Lion for the same price. Users of the Messages beta for Lion have complained of a number of issues including crashes and problems with syncing across devices, failure to send, and disappearing messages. 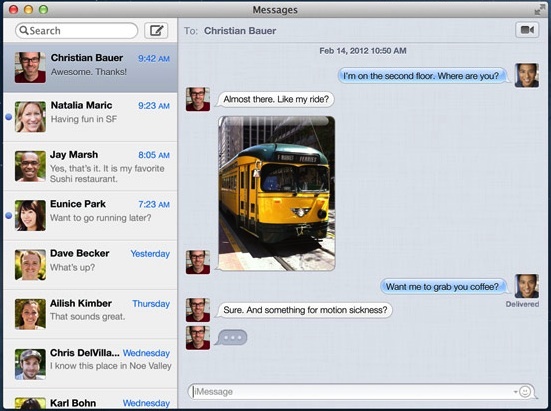 Many have been hoping for an update to address some of these issues, but it appears that Apple is focusing its Messages efforts on the final version it plans to include with OS X Mountain Lion. After using Messages Beta for a week, I ended up uninstalling it. Kept getting a red badge "1" on the dock icon that wouldn't go away. This happens for everyone. But I like it too much to justify uninstalling it. I agree, however, the badge is annoying. Stinks that the Beta will be inoperative eventually, because my girlfriend's Mac Mini won't be able to update to Mountain Lion and she's getting alot of use out of Messages. I bet they charge .99 for it and put it on the MAS, like facetime. I'm looking forward to the day when Apple (just to rub it into Microsofts face) decides to sell their next MacOS for 99 cent. You obviously don't understand the difference between making money on hardware or software. Apple only allows their OS to run on Apple made hardware. Therefore they are making tons of money on the hardware side. Technically, they could give the OS away for free and still make enough money. GET YOUR MAC MERCHANDISE HERE!! Guess where I think you should stick your MERCHANDISE!!! I've encountered some weird quirks too. Overall, I like it a lot. I've been using it as a replacement for Yahoo! since the day it was released in Beta. The only feature that I really miss is the ellipses when someone is in the middle of typing. I wish that worked with Yahoo!. I liked the concept... it is terrible at staying synced. I liked the theory behind Messages, and the way it was presented. However, in use instead of simplifying instant messaging it has added a layer of complication. Now, if I send an iMessage from my phone to a person, and then switch to messaging from my mac, it doesn't just show up in one stream as advertised; it comes from a separate account. Inevitably I receive back something along the lines of "weird, that last message from you said it came from ******@me.com" Then if I switch back to my phone, obviously it comes from my phone. So I guess it's unified on my end, in Messages, but completely disparate on the receiver's end. No worries about others beating you; there are worse things than a forum with multiple people attempting to help a fellow user resulting in some overlap. :) As for apple covering it, I must have missed that; I was at work so I could only occasionally check the MR feed. Haven't gotten to watching the video from Apple yet. In any case, I'm glad to see Apple is already addressing my concern. i dont understand why anyone would want those messages to show up on each device anyway, its so annoying. let's say you are currently on your mac book, why would i want those messages to also appear on my iPad and iPhone. i'd get sick of every device beeping or lighting up every few seconds one after another. i actually set up multiple email accounts so i can be reached on each device separately. I see what you're getting at, but I disagree; I look forward to the day where each device is just a portal onto the same computing experience; where it doesn't matter if you happen to use your phone, your desktop, whatever, because it all reflects the same content exactly as you left it. It's obviously where Apple (and others) are headed, but of course there are bumps along the way.